At that time the Roman emperor, Augustus, decreed that a census should be taken throughout the Roman Empire. (This was the first census taken when Quirinius was governor of Syria.) All returned to their own ancestral towns to register for this census. The Good News of God does not occur in a vacuum. 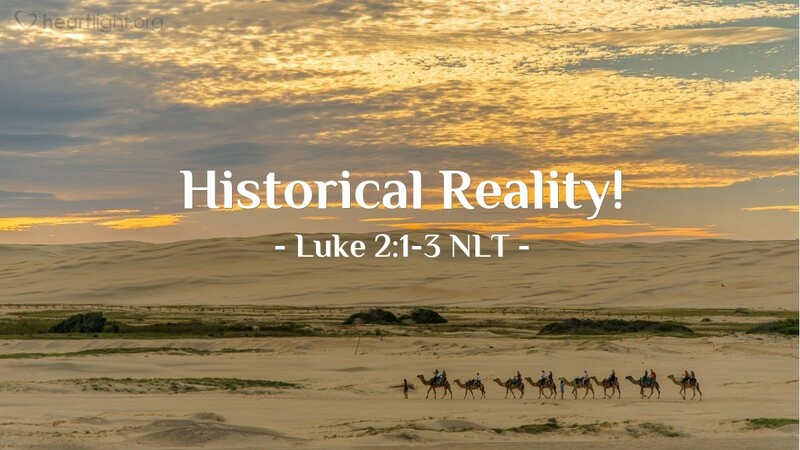 Luke wants us to know that Jesus' life was lived out in the real world, at a real time, with real people, who dealt with real problems. God does not want us to live our lives isolated and separated from his presence. He does not want us to have to reach beyond our grasp to find him. He wants us to know that he understands the limits of our mortal world. In Jesus, God has entered our real world to draw near to us and to draw us near to him! The real question is whether we will let him into our lives. Loving Father, our Almighty God, I open my life to you. You are welcome here. Come and draw near. Change me at your will. I long to be your child — not just in name, but also in closeness and in character. In Jesus' name, I pray. Amen.